Starting Sunday night at midnight, the IDF and Israeli Police began enforcing the prohibition of entry and presence of Israeli citizens in the areas due to be evacuated under PM Sharon's Gaza Plan. Four hours later at approximately 4:10 AM, Arabs in Khan Unis, under the control of Abu Mazen, fired mortar shells at Jewish homes in two neighboring towns in Gaza – Neve Dekalim and Gadid. At the time of the filing of this report, no injuries or damage were reported. On Monday and Tuesday, August 15-16, 2005 joint IDF and Israeli Police forces will demand from residents and civilians that are still present in the areas of the Gaza Strip and Northern West Bank due to be evacuated to leave the area. Officers will enter the Jewish towns and will hand deliver expulsion notices to the residents or paste them to the doors of the homes.Anticipating the entry of the IDF to deliver the orders, hundreds of Gush Katif supporters blockaded the entry to Neve Dekalim from midnight. When the mortar shells hit the town, municipal leaders called upon all the protestors to enter shelters.Residents of the Jewish town of Kfar Darom in Gush Katif posted notices on their doors today that read:Soldier/Police Officer – HALT. If you proceed to knock on the door, you will become a direct accomplice of the most terrible crime in the history of the Jewish People. We will not agree to be expelled from our homes. We will not budge from here ever. The new IDF prohibitions of entry imposed at midnight also apply to residents of the towns due to be evacuated in Gush Katif (Gaza) and northern Samaria.Sunday night at midnight, all entry permits to Jewish Gaza that were issued in the past, both permanent and temporary, expired. Entry will be allowed on an individual basis for those whose presence is essential for the implementation of the Prime Minister's Disengagement Plan. Specifically, entry will be allowed for forcibly removing the Jewish residents from their homes, for the security of the area and for emergency and rescue services. Despite the public perception that army refusals to take part in the expulsion are a marginal phenomenon, reports of unrest, lack of motivation and outright refusal continue to be collected. A soldier who immigrated to Israel from the former Soviet Union several years ago intentionally broke his own arm, in order to avoid having to take part in the expulsion of Jews from their homes. So reported his commanding officer on condition of anonymity, saying that the now-disabled soldiers is one of his best. A group of infantry cadets at Training Base #1, planning to complete their officers' training course two months from now, told their commander, "Despite all the mental and psychological preparations we are undergoing, you know that we're not planning to go down [to Katif] to do it." The commander then assembled the entire brigade of approximately 100 soldiers, and said, "Next week we're going down to evacuate Gush Katif. How many of you are coming with me?" Forty per cent raised their hands. A 2nd-Lieutenant has been warned that he will not be promoted in light of his refusal to take part in disengagement preparations. Lt. Yigal Vanunu was sentenced to 21 days in prison for a similar offense, and Pvt. Aviel Mark was sentenced to 28 days for refusing - for a second time - to take part in the expulsion. A female Air Force driver was exempted from taking part in the expulsion after she announced that she would not do so. A Border Guard soldier who has already served seven days in jail for similar offenses said he will leave the Border Guard in order to avoid taking part in the expulsion. Over two dozen soldiers in a company-commanders course informed their commander that they will refuse to take part in expulsion activities in Gush Katif - in the knowledge that this would prevent them from being able to complete the course. They asked to sign "concession" forms for the course, but in light of the increasing tendency to do so, IDF Chief of Staff Lt.-Gen. Dan Halutz has outlawed the forms. A lecturer who was invited to speak with a group of IDF officers about to take part in the disengagement reported afterwards that the atmosphere of discouragement and depression amongst them was palpable. A group of 15 religious-services officers informed their commanding rabbinical officer that they will not take part in the disengagement. Their officer advised them to find a way to avoid taking part, and they told him that they would not take part even if they do not find an elegant way out. 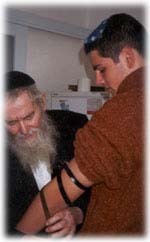 While writing the previous article dedicated to the yortzait of Rav Zilber http://moshiachtv.blogspot.com/2005/08/rabbi-yitzhak-zilbers-yortzait.html I have discovered this story I'd like to share with you. A native of Kazan, Russia, Rav Zilber was born just before the Russian Revolution in 1917, but was discreetly taught Torah by his revered father and not only completed Shas several times during his years in Russia, but also taught Torah to many others. During World War II, he was imprisoned in Stalin’s gulag where, yet hemanaged to remain Shomer Shabbos despite the inhumane conditions. He later had to flee from the KGB, which wanted to arrest him for his Torah activities in Russia. In 1972, he emigrated to Israel. As he walked off the airplane on his arrival in Israel and embraced the custom agent. Chavivi! My dear one! shouted Rabbi Zilber as he gave the man a bear-hug embrace. It is so wonderful to be here and talk to a Jew like a Jew! The man offered a polite smile and a pleasant Shalom. Ma zeh K’tzos haChoshen. (What is a K’tzos haChoshen)? came the reply. Rav Zilber was puzzled. He tried another query. Maybe you can explain how you understood the Mishne in (tractate) Uktzin in the last chapter. Mishne? Uktzin? K’tzos? What are you talking about? Rav Zilber, recalling the difficulties he had trying to teach and study Torah in Russia was mortified. In honest shock, he asked the man. How is this possible? You mean to tell me that you live here in Israel and have the ability to learn Torah. And you don’t know what the Ktzos is? You never heard of Mishne Uktzin? Rav Zilber began to cry. They say that the customs agent was so moved by Rabbi Zilber’s simple sincerity, that he began to study Torah.